Nutrition Program sends off graduates into the professional world in a ceremony attended by guest of honor Fouad Makhzoumi. 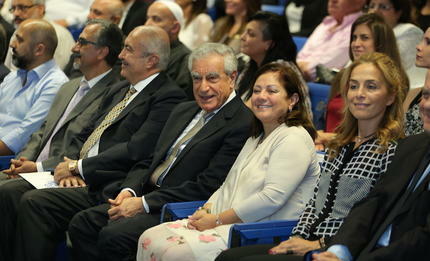 President Joseph G. Jabbra, Dean of the School of Arts and Sciences Nashat Mansour, businessman Fouad Makhzoumi with Mrs. May Makhzoumi at the ceremony. 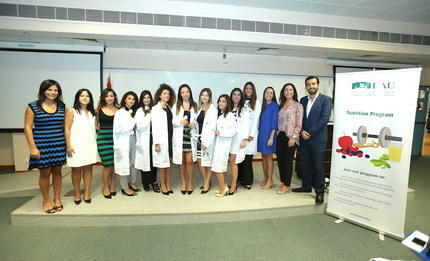 The graduates took the oath of nutrition and dietetics profession at the end of the ceremony. The graduates were joined by their professors for one last group picture. 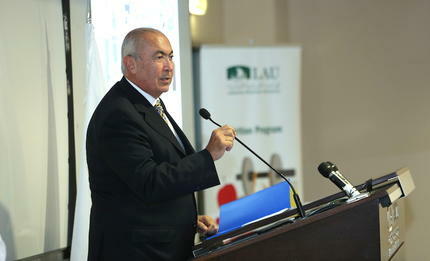 Businessman Fouad Makhzoumi commended LAU and President Joseph G. Jabbra for doing a fantastic job of incorporating innovation and technology in education. Businessman Fouad Makhzoumi advised the graduates to be well equipped for a world that is constantly changing, saying that the only way to do so was through education. 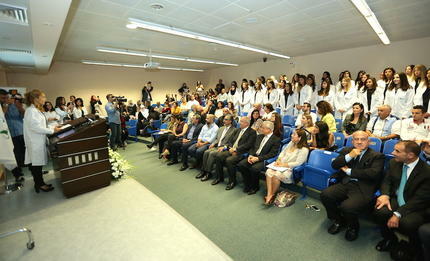 The Nutrition Program at the Department of Natural Sciences honored 37 graduates in a White Coat Ceremony on October 23 at LAU’s Beirut campus, attended by LAU President Joseph G. Jabbra, guest of honor, philanthropist and businessman Fouad Makhzoumi, and Dean of the School of Arts and Sciences Nashat Mansour. The bachelor’s degree in Nutrition and Dietetics – Coordinated Program (CP) entails three years of theoretical learning with an additional year of supervised practice. The dietetic internship may be conducted at LAU Medical Center-Rizk Hospital or one of the university’s partner hospitals. In order to qualify as licensed dieticians, interns are required to complete rotations in clinical nutrition, food service management and community nutrition. The Makhzoumi Foundation is one of LAU’s community partner sites where they can fulfill community rotations. Associate Professor of Nutrition Nadine Zeeni subsequently invited the honorees to reflect on what the white coat symbolized to them and on the message they wished to convey. “Today we mark a transition as you take your first steps toward clinical learning where the patient or the client becomes the ultimate teacher. It’s not us anymore,” she said. Thanking the graduates, Zeeni noted that in under six years LAU’s B.S. in Nutrition, coordinated program in nutrition and dietetics, and the internship program have ranked among the top in Lebanon and the region. In his address to the graduates, Makhzoumi advised them to be well equipped for a world that is constantly changing, saying that the only way to do so was through education. “Any civilized country that believes the future is there needs to invest in education and research,” he said. “Your education is going to make a difference in our world and our society,” he told the graduates. He called for a clear health policy in Lebanon to fight the rising cost of healthcare and improve the standards of living, starting with nutrition and tackling the spread of obesity. He warned that in the absence of such a policy Lebanon’s health system risked collapsing. 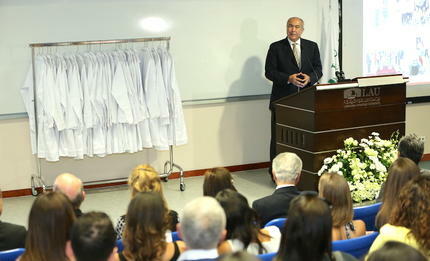 Zeeni then invited faculty members to cloak the graduates, who brimmed with pride as they donned their white coats in the presence of their proud parents, staff and faculty, and dietetic internship preceptors from hospitals and community organizations. “We are now in a hospital setting, impacting the lives of patients,” said dietetic intern at Hôpital Libanais Geitaoui Fatima Kawtharani, recognizing the responsibility she was taking on. The ceremony ended with the graduates taking the oath of the nutrition and dietetics profession, fully prepared to meet the high expectations they have set for themselves.